This race was a personal worst when it comes to marathon times but it was an incredible course. Don't let my time fool you. This is a very runnable course. The winner came in under 3 hours so most of the course you can run fast - really fast! It's not an extremely technical course which makes it easier even given a few larger hills. The area is really fun and it makes for a great weekend away. If you have not run this race yet, it's something you need to put on your list. 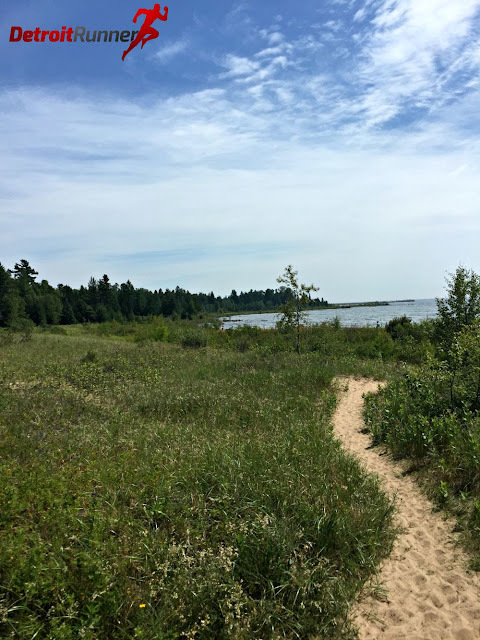 This is race #3 in Michigan for Great Lake Endurance (with Tahqua Trail and Porcupine Mountains still to follow) and once again, I am extremely impressed with the locations and courses they have chosen for their races. Registration is very simple via the Great Lakes Endurance website. Sign up is through Active(dot)com and really easy. 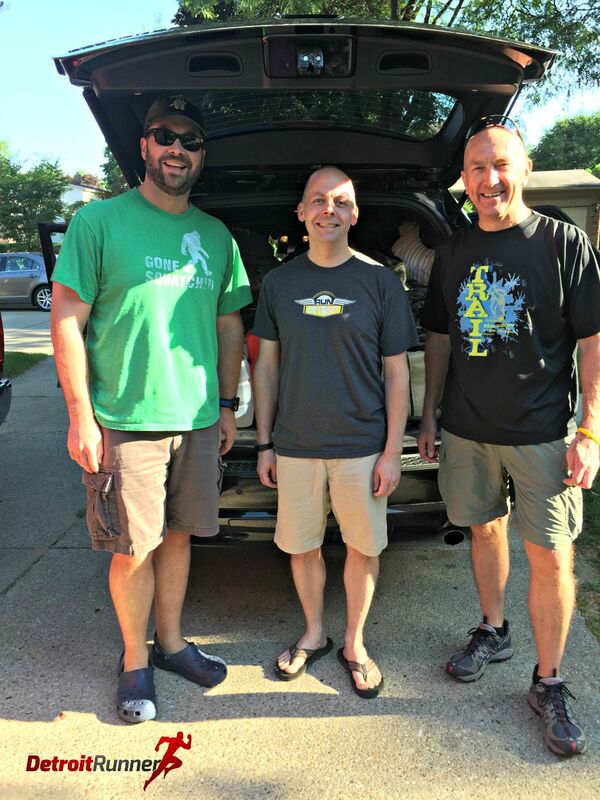 For this race, I went up to Northern Michigan with my running buddies, Kevin and Dave. We were all signed up for the marathon. 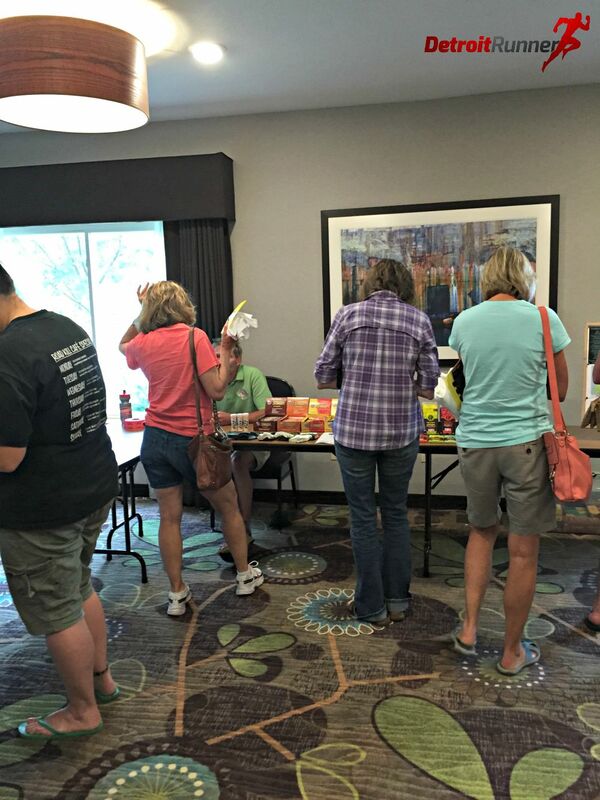 We picked up our packets on Friday evening at the local Holiday Inn Express in Munising. We saw more literature about their races along with seeing our friend, Susan, on the papers. It's cool to see someone you know on the race information. 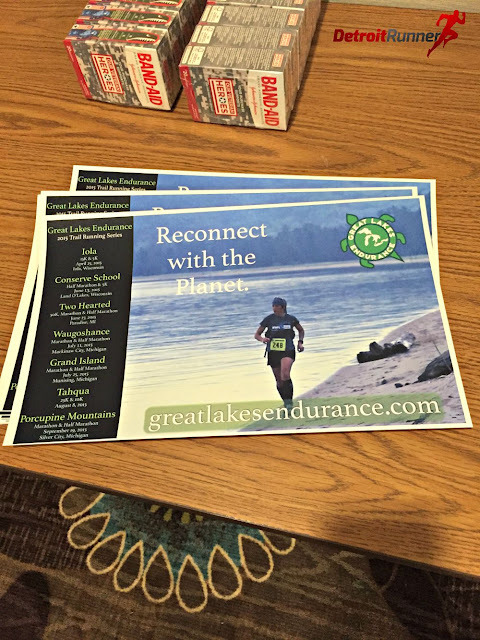 As with all of Great Lakes Endurance races, packet pickup is very simple. They log you into the system via an iPad and assign a bib number for you. You get your tech shirt and you are good to go. They also offered last years shirts as well as this years shirt to choose. A nice option if you wanted a different color. 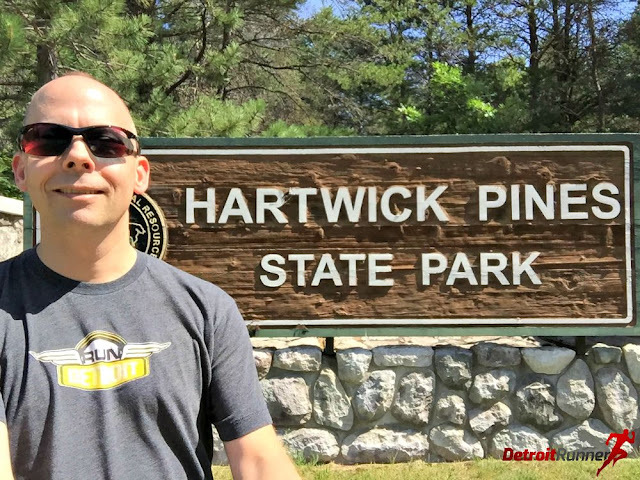 We talked to Jeff, the race director, for a few minutes and he told us a little about the course and where to get some great pictures. That was certainly no issue on Grand Island as the scenery is spectacular! He gave me a particular spot at mile 15 and boy was he right - it was awesome! 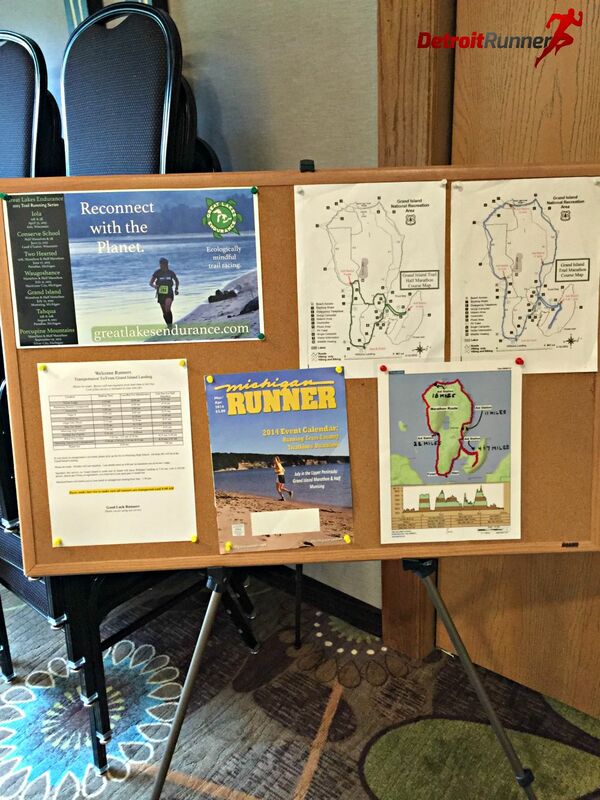 The race company had all the literature out for the maps of the race as well as the shuttle schedule. Included in your race entry was pickup and drop off of runners from their hotels or campgrounds (not all but most in the area). It made things very easy in the morning since we didn't need to drive to the boat launch. We literally waited a minute each time and the shuttle was a nice touch. 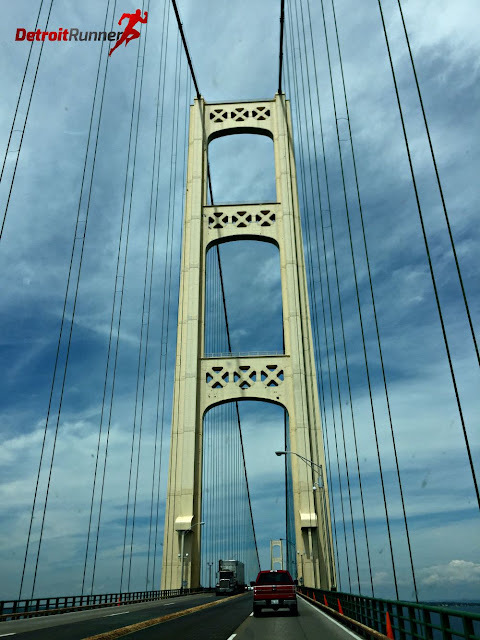 As I mentioned, we started our day on Friday morning to make the seven hour drive to the area. The car was packed and we were ready to go camping for the weekend. 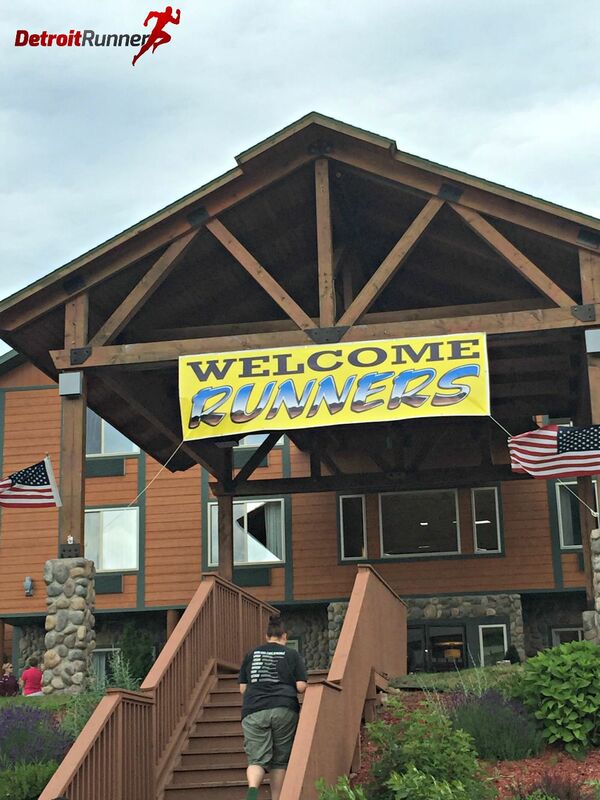 An awesome camping and running weekend! Since our buddy, Kevin, had never been to Hartwick Pines State Park, we made a slight detour on the way up north to see the park. It really is a nice gem and I'd love to go back and camp there. There was a logger museum there as well as huge trees to see. It was a nice side trip but added about an hour to our drive up. Soon we were in Mackinaw and crossing over into the Upper Peninsula. 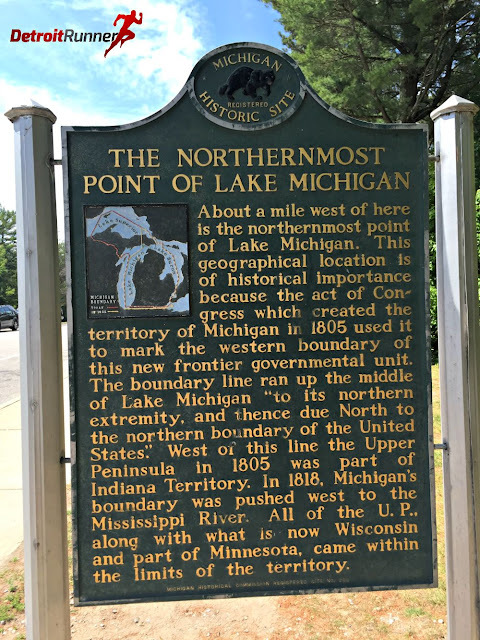 We made a quick stop after the bridge to a rest stop and it happened to be the Northernmost Point of Lake Michigan. It was a great view of the water. 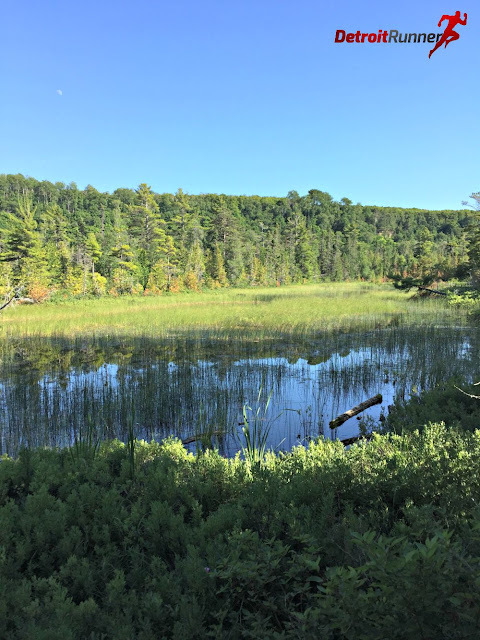 A few hours later and we were in Munising. 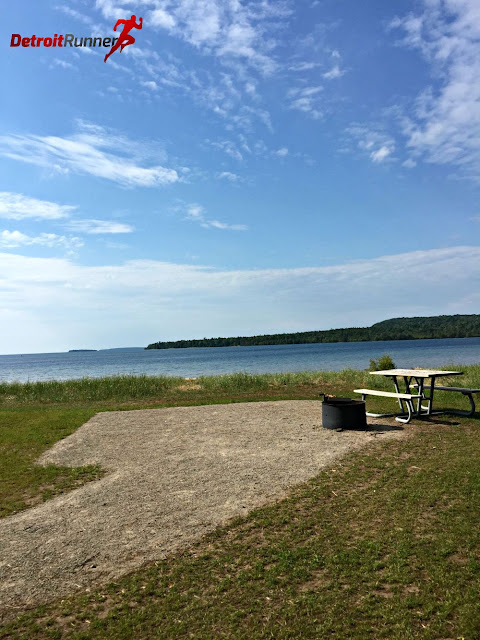 We made reservations at the Munising Tourist Campground back in February which is just a mile down the road from packet pickup and the boat launch to Grand Island. We actually ended up with a really great campsite (Site K) which was right on the water of Lake Superior. The views were awesome and looked over to Grand Island. 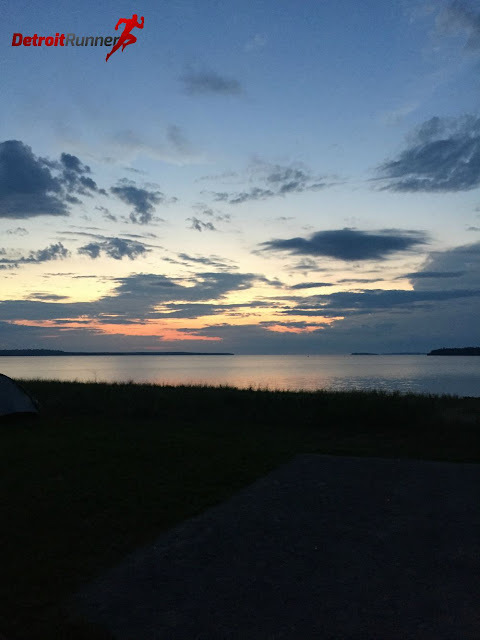 We had incredible weather the entire weekend except for a huge thunderstorm on Friday evening from about 1-4 am! It was crazy being in the tent with as much rain as was coming down but we stayed dry. 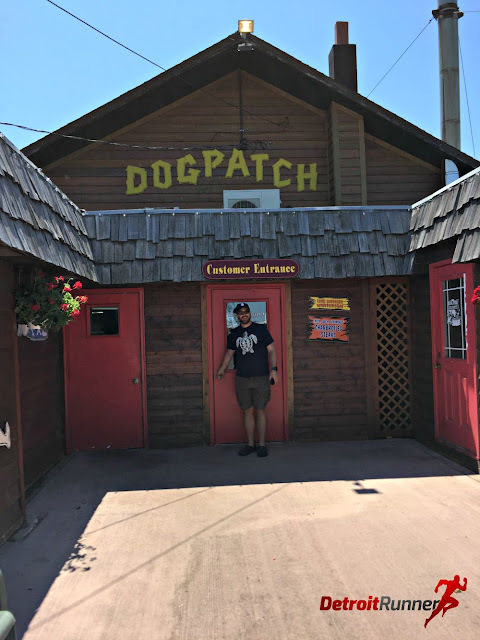 We also made a stop at Dogpatch after the race to eat lunch which was a good place to get a beer and food. 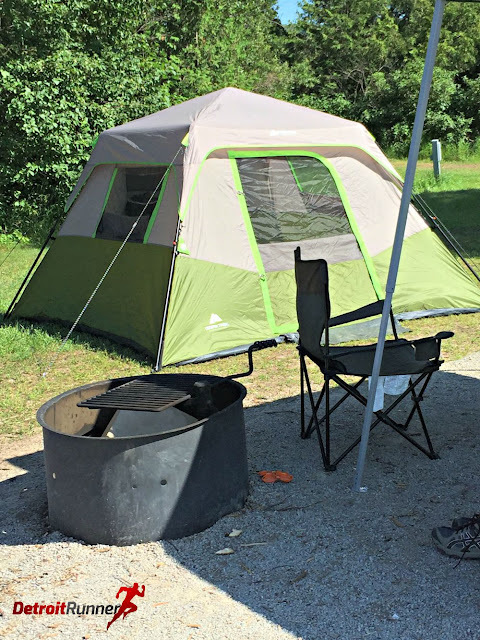 As you can see, we had a nice firepit as well as a large tent and a covered canopy to stay out of the sun since our site was all in the sun. 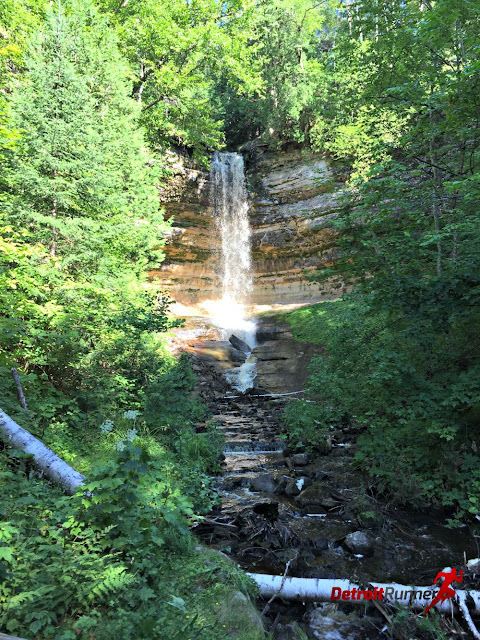 After the race, we also made our way over to Munising Falls to see it. It's one of the best falls in the area in my opinion and didn't require too much walking after just running a marathon. We also went to Sand Point Marsh and walked around that area on wooden bridges. It was a beautiful area and also had a really nice beach. A few miles up the road, we also visited Miner's Castle. Personally I think it's one of the best sites in the area. Kevin and Dave planned to run 10 miles the next day of the marathon (yes, they are crazy!) and since I was not joining them for this, we went up there by car. While my legs didn't like the walking, I knew they would feel better the next day, the more we walked. We got another fantastic sunset the evening of the race as well and being at the campground was one of the best places we could have been to enjoy the weather. 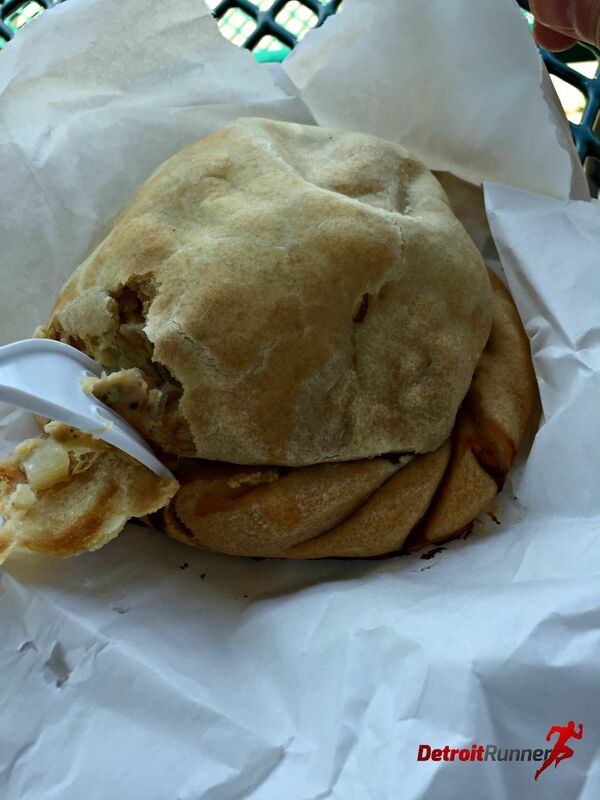 The Sunday of the race we stopped at Muldoon's for a Pasty. I got chicken and it was delicious. Yoopers eat theirs with ketchup but many also like gravy. I used ketchup and it was so good! 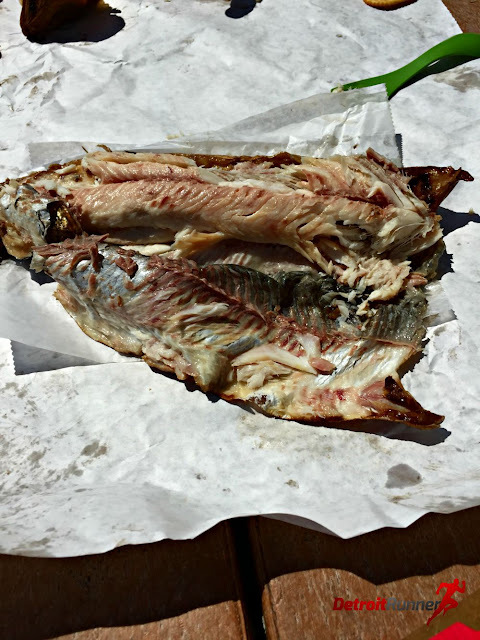 We also made a stop on the way back for some smoked fish. This stuff is expensive but so tasty! The place we bought it also had some beer for sale that I was happy to see. 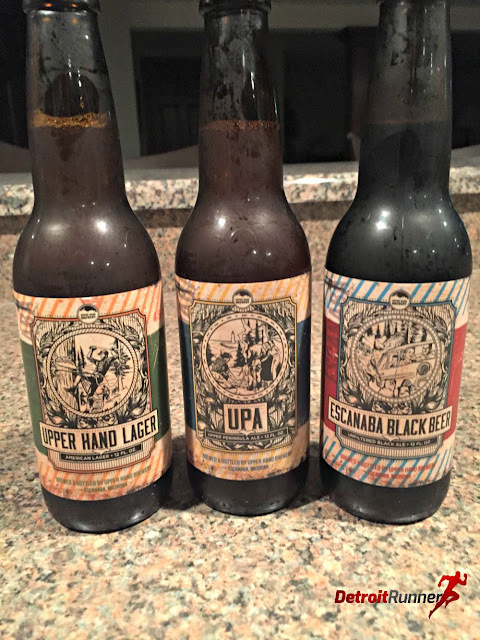 The company is Upper Hand Brewery and it's new and a division of Bell's. I've had two of the three already and they are incredibly good. The morning of the race was a really early morning. We had to start running at 6am so we needed to be on the bus at 5:30am! Yikes, we ended up getting up at 4:30am to be ready for the race. Because of the storm, I only got about four hours of sleep. Ouch! You can see the picture below shows a little light on Grand Island. The volunteers needed to be there at 5:10am to be ready for us runners and they were ready! There was also a 7am start option but since Kevin and I expected to be over 5 hours in the race, we opted for the early start. We also had an opportunity to meet Dave H, one of Kevin and my Twitter friends, who was up here running his first marathon. He killed it with a sub five hour time! As is tradition, we took a pre-race picture. 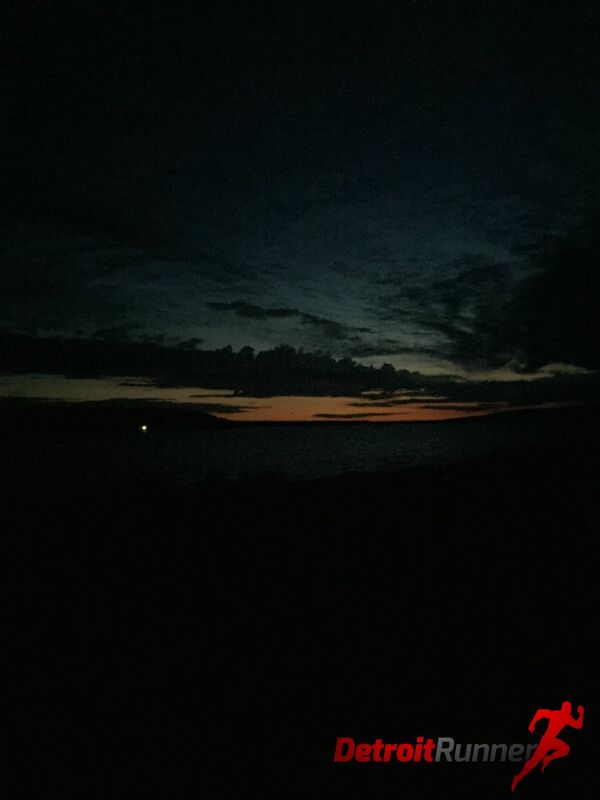 It was still kind of dark out so the picture didn't come out perfect but it will have to do. We are standing behind the drop bag area as the race had an area to put our stuff to keep it dry during the race. 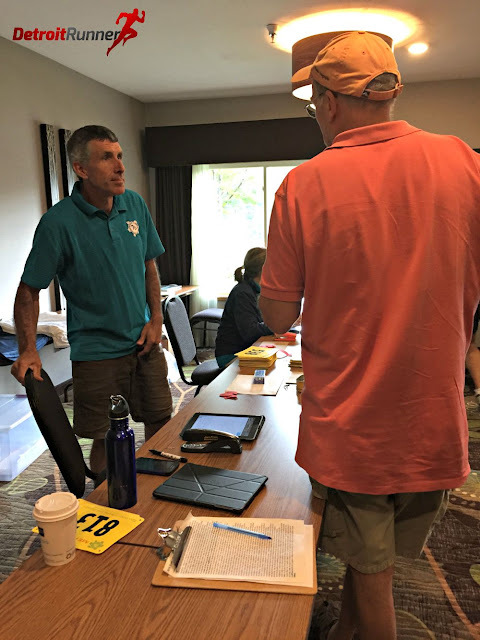 Before we knew it, Jeff, the race director, was doing his announcements. We were to follow orange flags and always on the right. I joked with Kevin to watch carefully since he got lost at Two-hearted 50k. Fortunately, the course today was well marked so no worries of getting lost. 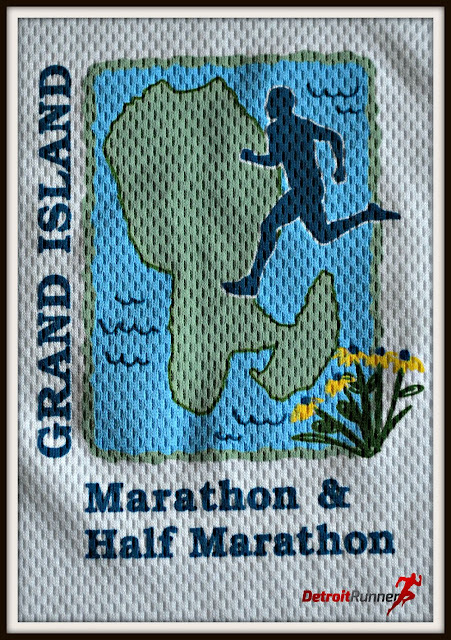 The course is a loop around Grand Island with a small approx. four mile out and back. We started on the South end of the Island and went counter clockwise around the island. While you can see that we encountered some hills on the course, it was not relentless hills but you sure had to give it your all when you got to mile 19. By that time, I was pretty tired and the hills were killing me by then. Unfortunately, it was not my day, and by the time I got to mile 15, I was pretty much out of steam. The running on the beach really killed me and my foot started to hurt which really slowed my pace down. The good thing is that I was able to recover this week pretty easily. The sun was just starting to come up with the 6am start and the sky was full of color. We passed a few cottages on the water and ran on a dirt road. Frankly, the first four miles with the out and back was not that exciting. Don't get me wrong, I completely loved the course but the first part of it had me worried it would be all on dirt roads and dark trails. Fortunately, the race just got better and better and better as we ran more. Kevin was looking strong this morning and I knew he was going to have a great race. As mentioned, part of the start was on the dirt roads. We didn't see any cars except for the forestry people doing some work. We actually passed a nice beach near this area that was beautiful as the sun was coming up. The half marathon followed the blue flags with marathon runners following the orange flags. Because it had rained so hard, some of the course had water on it. Frankly, I was really surprised that we didn't see much water as the island seemed to drain really well even after such a hard pouring rain from last night. Then the climbing began already and this first hill was a killer too! It was not only muddy but hilly. Haha! I took a picture from behind me so you could see what we were climbing once on the top of the hill. The good part is there were really only four large climbs so it made the course very enjoyable. This is the out and back section and it was somewhat difficult to see as the sun was still coming up and there were lots of tree branches on the ground to trip over. Fortunately, I did not fall once the entire race. Soon we were heading back as there was a turn around on the out and back section. The race did a great job making sure we had directional signs so we went the correct way. It was also nice to see the fallen trees and, if they didn't get in the way, were left alone in their nature habitat. A really nice road to run down. Before we knew it, we were heading towards the beach. While the beach had some of the best views of the entire course, it made for a really difficult run since you were not running on a level surface. Fortunately for us, the rain helped keep the sand impacted so it was a little easier than it would have been had it not rained the night before. We could also see some of the rocks on the cliffs too as we made our way down the beach. There was also a photographer on the beach taking photos of everyone. I hope she got a good photo of me. Just about when you were tired of running on the beach and sand, we turned off and headed back to the dirt roads and trails. I stopped a second to knock the sand off of my shoes to make it easier to run again. I wanted to get back to the single track and this was where it really started. It was great except for another hill to climb. Haha! As we continued, we started to see caution signs on the trails. You will see from the pictures below why, as much of the trail was right next to a cliff so you needed to be careful. I also didn't feel the bugs were too bad. Yes, there were mosquitoes and, if you stopped, they would swarm you, but as long as you kept moving, they didn't bother you at all. Also no flies or deer flies that I saw anyway. I had more on my recovery run today at home than anything I saw on the island. 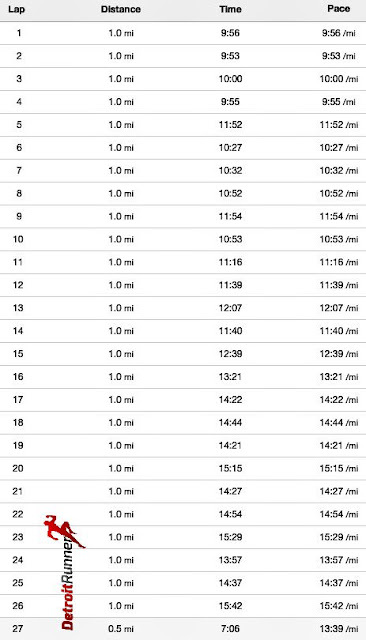 Then the split for the half marathon and marathon came. Decisions, decisions.....okay, I guess I decided to stick with the full marathon so I made the turn right to follow the marathon course. It was the right decision. While I'm sure the half was also a fun route, I believe the views would have been better on the full course considering we were running around the entire perimeter of the island. And I was right, check out that awesome view we were rewarded with after a nice climb up a hill. Once again it was back to a nice wide trail to run which was fairly flat. As well as flat two tracks along the way. Once I hit this sign, I knew that the views were going to become awesome. It appeared the island is set up to drain quite well into the lake as you can see below. The picture below is right on the trail. It was seriously amazing! This is actually about three steps off the trail. Yes, the caution signs are real and you needed to be careful not to fall down but I just had to have some pictures. Before I knew it, I was at the half way point. I was thinking to myself, maybe I should have run the half? Not! Not with amazing views like the one below. I could not believe it but the views kept getting better as we ran longer. Soon we were seeing the sides of the cliffs on the island. It was hard for me to continue running and I just wanted to stay and enjoy the views. To give you an idea of how far up we were, I took a picture looking down of the height. It was really high up! This is the shot the race director told me about at mile 15. It was worth it to take the 10 or so steps off the trail in order to see this view. It was one of the best views on the island and I'm glad I took the time to see it even though it cost me some time on the race. From here the cliffs just started showing up more and more like the one below. I could not believe that we were right on the trail with these amazing views. This cliff almost looked like a little Miner's Castle but this was actually still on the island. The trails were equally nice as you can see below and we had a beautiful day for running and were really lucky with the weather being so nice. Eventually we started a decent down to where the water and beach was. Unfortunately, I didn't have time to go off course anymore but you get the idea of what you could see from the trail. More climbing at mile 16 as you can see the running in front of me is much higher than I am. Of course, it was the only way you could get more awesome views like the one below. More on the trail - wow! We also got to a point on the course where there was a little more mud but it still was not bad at all and you could avoid any bad parts on the course. Below was also a very nice area and one of the best views that I think we saw on the island. I can see how the race director feels this is one of the best places he's run. It really is a special place and seeing the island on foot was the best way to be able to see it. It was jaw dropping and I still could not believe that I was standing on a trail. I'm seriously on the trail! Below I took a picture of the gate that shows where the picture above was taken. It shows how we are on the trail yet the views are right there too. I even had a girl running offer to take my picture but I didn't want to stop her from her run so I said no. Mile 19 was a really tough mile since it was all up hill. It seemed like this mile went on forever. I guess it did since it was almost my slowest mile at over 15 minutes. I was happy to be at mile 20. I know that I had much to run but at least the course was at a point where it was mostly downhill from the 20 mile marker. The woods side of the trail was also equally nice. The view below was another of my favorites. I love seeing the tree roots with the pine needles overlooking the water. That is my perfect trail to run. I was following the guy ahead of me with a run/walk by this point but I kept going and going even though the top of my foot hurt and my IT band was starting to hurt from the downhill. The end of the race also didn't disappoint and had some more incredible water views. We were back to a little mud but I would guess that this area was probably the worst I saw on the entire course. A pine tree was on it's side which made for a really nice picture. The sun was out and the birds were chirping. It could not have been a more beautiful day to run a marathon but I was happy it was almost over. We were almost back to the start area and there were also some really nice campsites on the island. I wish I had thought to take a few pictures. By this time, all I wanted to do was finish and get something to eat. Yeah! Mile 25 and we continued to run.....well, for me it was more walk/run. The trail was very pretty with the sun shining on the ferns next to the trail. There was no place else I wanted to be than right here running. Mile 26 came and went. My watch showed a 26.5 mile course for the finish. It was the final stretch of the race and you could hear people as you were coming. As you came through near the finish, people were cheering you in and giving you thumbs up to finish strong. It was nice to have that last bit of motivation. I made it! Not my best time but I thoroughly enjoyed the course and was so happy that I was able to finish and enjoy the views. There were several aid stations. As with all of Great Lakes Endurance races, the volunteers had water and HEED to give us as well as Gels at a couple stops. You needed to carry a water bottle or hydration device and they would fill them up as you stopped. You also needed to carry any garbage that you used since we needed to keep everything off the island. You can see they had on mosquito masks in the beginning since they were standing still and needed to be covered. Later in the race, the masks were not needed for the volunteers as the bugs were not as bad as the sun came up. The volunteers did a great job and were very helpful at each aid station shouting out water or HEED so you knew were to go. 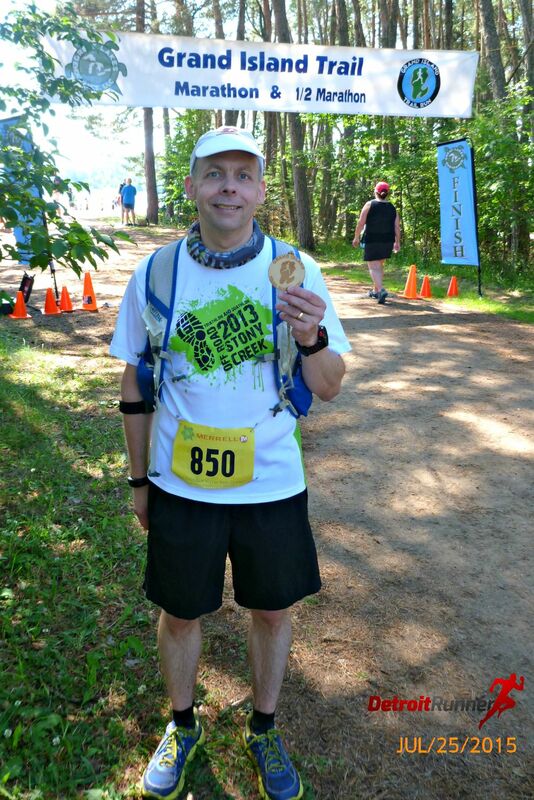 The finish area had water, HEED, cherry juice(my favorite of the race) and bananas, pretzels and fig newtons. I had a couple fig newtons and cherry juice and walked around a little to get my legs to stay loose. There was already a line forming for the boat back to the mainland. I could not think of a better way to see Grand Island than running a marathon around the island. The race is in a very unique location with lots of logistics that need to go into this to make it a successful race. Great Lakes Endurance did a great job on that. The beach was also right there and many runners finished the race and ran right into the water. 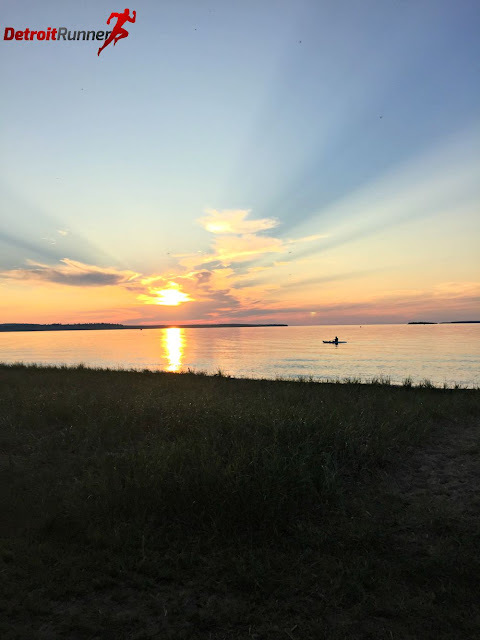 The cool waters of Lake Superior could help give you some relief from all that running. The timing company was there and had instant results on a print out they give as well as on a TV screen. After a little bit of stretching, it was time to make our way back to the campground. We had probably a 20 minute wait for the boat as it only held so many people. The boat ride is only an 8 minute ride over to the island. While we waited in line, we watched as runners got into the cold waters of Lake Superior. Once back on the mainland, we waited a few minutes and a shuttle showed up to take us back to the campground. From there, we enjoyed the rest of our afternoon resting at the campground and doing the site seeing that I mentioned earlier. 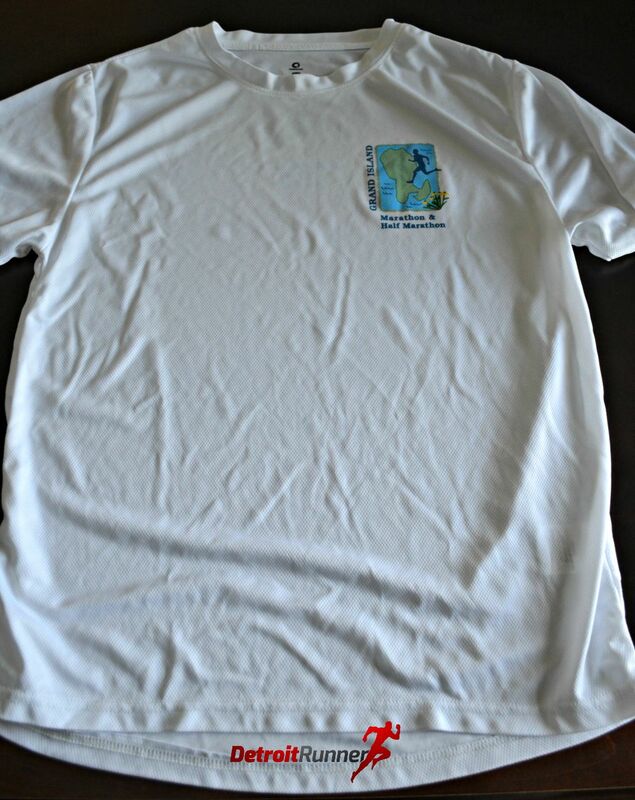 For your race entry, you received a custom big with a timing tag. The race also included boat tickets to and from the island for runners and your family could buy tickets if they were not running. The entry also included the shuttle to your campground/hotel. For what was included, the value of the entry was really good in my opinion. 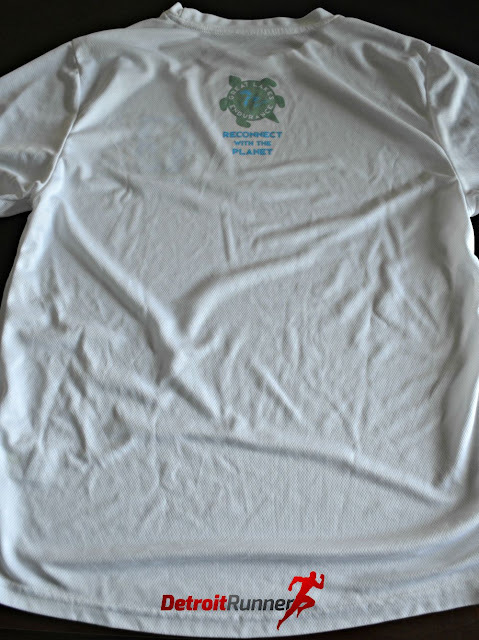 A nice tech shirt was included with no sponsors on the shirt. I love several things about the shirt. I love that it's tech material and that it's a small chest logo as well as a small logo on the back of the shirt. As with all my Great Lakes Endurance shirts, this one will get used frequently in training. 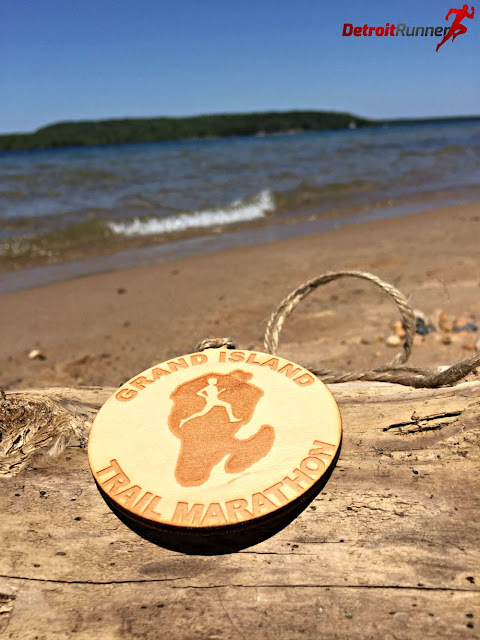 You also received a wooden medal for finishing and they were a great design with the typical rope ribbon that Great Lakes Endurance is known for. If you were fast enough to win your age group, instead of a wooden medal, you received a hand blown glass medal and these were awesome! I might need to train hard to get one of these! The organization of the race was excellent. 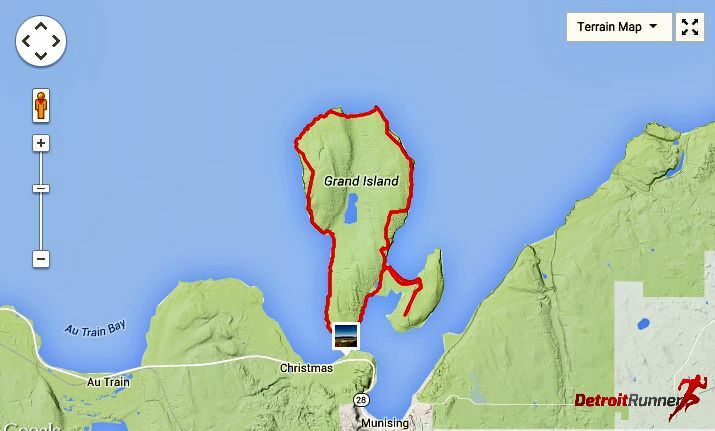 Communication is clearly planned out on Great Lakes Endurance's website. They answered any questions you had a packet pickup. There was Facebook posts with any changes(which there were none) and the course was well marked so you didn't get lost. The shuttles were one time and you didn't need to wait for them. Registration is very simple via online. The start and finish area was well laid out and everything had a place that fit well to keep things in order. Overall, this was a spectacular marathon and weekend. My buddies and I had a great time the entire weekend. The area is so fun and the camping was great. The race experience was one of my favorites and the course was one of the most beautiful that I've been on. While it seems a lot to drive over seven hours to get to the area and back, it was well worth the drive. If I had one suggestion, I would suggest taking off Monday as well so you can enjoy more of the area. I would have been happy to stay an extra day and do some more site seeing even though my legs were tired. My buddies even ran 10 miles on the North Country Trail the next day! I was not up for it the next day but wish I was as it sounded like they had a great time. I would highly recommend that if you have not run this course, that you put it on your list for a future year. You will be really happy you picked Great Lakes Endurance's Grand Island Marathon. Next up is the Tahqua 25k for them in two weeks. I hope to see you there! Kevin, me and Dave all finishers! Disclosure: I received a discounted race entry in exchange for this review. All opinions are my own and I was not required to give a particular opinion other than an honest one. Great writeup of the run, Jeff, and really beautiful pictures. Great photos! I'm glad you had such a beautiful day for the race.